Real-World Issues: such as differences of opinion on money, family, debt, children, blended families, houses. Attachment Issues. This often shows up in communication as couples fighting about how they fight. The communication itself: when there is a shortage of empathy, when people don’t listen, when they defend themselves, when they miss security questions. Here we’ll describe a simple method we teach to our clients that addresses the third issue above, communication itself. If something is important enough to fight about this means it is important for the couple to work on. A healthy couple listens to their partner’s concerns. If it matters to one person then it is worth the time needed for the other person to understand. Simply put, in bad communication we spend most of our energy getting our point across, or defending ourselves. We don’t listen to the other person. And since we already know what we think, we are learning nothing. If the other person is upset it usually means we don’t really understand what is going on for them at a feeling level. 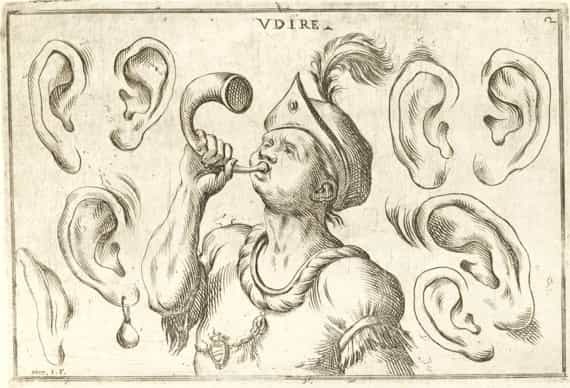 Reflective Listening is about getting to the heart of the misunderstanding, and finding out (underneath this) what’s actually happening for the other person. In Reflective Listening done well we can have the uncanny feeling of suddenly coming to the position of a third person, of breaking through an impasse. The “argument” becomes dissolved because we’re no longer in it – we’ve dropped beneath it in a simple yet subtly powerful way. As one partner might say (in a relieved and positive voice) “I had no idea you we’re thinking that!” or “I had no idea and it makes me really sad to hear you felt that way”. Reflective Listening is effectively a slowed down conversation requiring time and attention. There has to be a willingness to feel emotions and be honest about those feelings. This exercise can help build trust if used correctly. The speaker chooses a topic and may start with “I’d like to talk about …”. The speaker uses one short sentence at a time. Remember it has to be short because the other person has to repeat it and feel what it’s like for you. It also stops long-winded monologues and emotions rising. The listener just listens, and repeats back what they have heard: “What I heard you say was…”. Note: The listener is not allowed to embellish or give their “side” to the “argument” yet! The speaker continues, or corrects the listener if what they heard wasn’t quite right. (“What I actually said was…” or “That’s not quite right, I said…”). Note: The listener’s role is important and they should stay very aware and involved. Mere parroting of the speaker will not work! The speaking / listening sequence continues until the speaker has finished what they wanted to say and feels heard and understood. Now it’s time to swap roles. The speaker becomes the listener and the listener becomes the speaker. Once the second speaker is done, the first speaker may want to go again.The process continues in this open-ended way until both partners have completed what they wanted to say and both feel they have been listened to correctly (from the feedback they’ve received from the listener). Essentially, it’s checking in with ourselves, because we have the time to think about what is most important to say. We are really listening and giving time to understand each other more deeply. This process may take anything from 5 minutes or 30 minutes. You should not be thinking about what you want to say while you are listening, because that is not listening! Don’t disagree with the speaker… you’ll have your turn. Once you have mastered the skill of Reflective Listening then you can use it in daily interactions, as a single sentence (“So what I’m hearing you say is…”). Just check in when you are not sure you understand what is happening for your partner. Or you can ask your partner to reflect back what you have said, if you feel it is important and want to make sure they are not making assumptions or jumping to conclusions. Couples who take the effort to follow the steps of Reflective Listening carefully can be in for some positive surprises. They feel differently after the process. It may take some time and practice at the beginning but it is well worth the effort. Once a couple gets familiar with the practice and knows that talking is safe it can be used just to check that you really have understood what is happening for the other person. It ultimately saves a huge amount of time arguing and the pain of feeling misunderstood. Reflective listening is simple but takes practice. It is a way of showing that you want to resolve an issue and not just “have your say”. 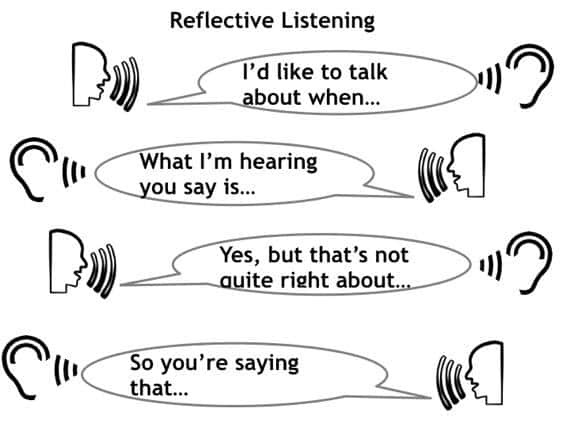 Reflective listening is a way of showing that you want to resolve an issue and not just “have your say”. Some couples struggle at the beginning to break their negative habits of interrupting, dismissing and rushing in to fix a problem with a practical solution – rather than staying with their partner while the real answer unfolds. But keep practicing! We are of course happy to help couples practice Reflective Listening, but you can also try this at home.